Oil meter (mass flow meter) "Centrosonic"
Counter of liquid "Centrosonic" is the first in Russia high-precision ultrasound device for commercial accounting for mass and volume of oil products, alcohol-containing liquids, vegetable oil and another liquids including liquid foodstuffs. Measurement of flow rate, volume and mass of product; (UV-7). Indication on liquid-crystal (LC) display of UV-7: operation time, flow rate, mass, volume and density. Measurement of density, viscosity and temperature of product (PLOT-3). There is a modification with indication on LC-display of temperature and density (PLOT-3). Maintainability, availability of 85 service centers at territory of Russia and Ukraine which are able to perform repair, adjustment, mounting and warranty-covered service of the devices. Operation life-time - no shorter than 25 years; warranty term - 4 years. Remote transfer of indications and connection to personal computer. 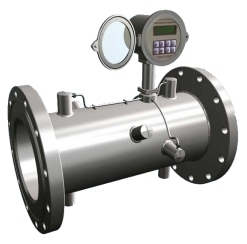 High precision of measurements is reached due to application of the latest developments in technology of ultrasound flowmeters and the latest achievements of electronic industry. Feasibility for on-line determination of mass and/or volume of any liquid without re-adjustment of the device. Measurement of density and viscosity by special high-precision densitometer of class 0,05%. High corrosion resistance. Primary flow converter is made of stainless steel and titanium-based alloys. Absence in pipeline of moving parts, constrictions, beams, etc., which can cause a pressure drop in the measuring section. lightning-protection unit (according to an order). Types of measurable products Commercial oil, oil products, alcohol-containing liquids, vegetable oils, liquid foodstuffs. Principle of action Ultrasound, pulsed, time-of-flight. It is recommended to conduct in-operation adjustment of the device by means of dynamic weighing on the scales with accuracy class of 0,02 %, with capacity on the scales up to 30 m3, for Dy-300 and Dy-250, for another Dy values the capacity should be reduced in proportion to maximal flow rate. From 0,5 Fmax to Fmax . From 0,1 Fmax to 0,5 Fmax .